The closing for the sale of the synagogue building was January 20, 1993. 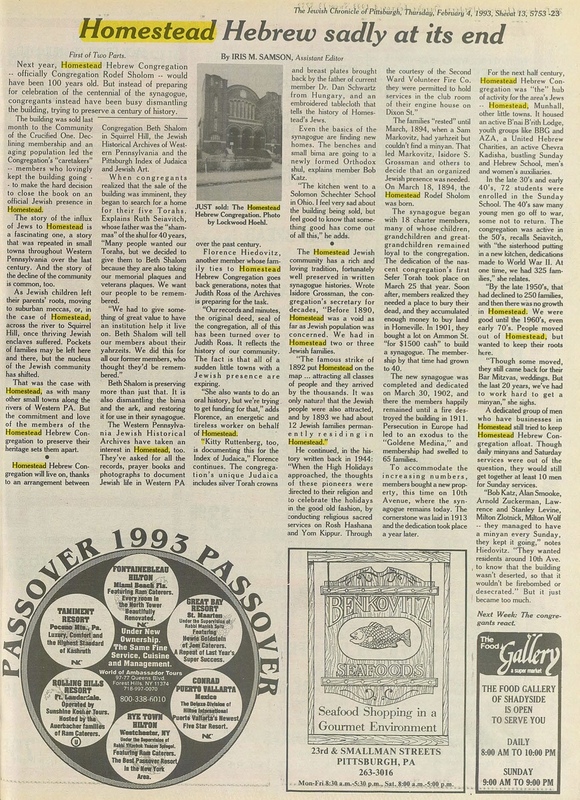 Shortly thereafter The Jewish Chronicle of Pittsburgh wrote a two-part series about the history of the synagogue. It draws upon the synagogue histories available on this site, as well as the memories of the last generation of members, leaving out much of the middle. My cousin, Morton Keisler, wrote a letter to the Jewish archives listing some of the missing people, concluding, “The history of the congregation is 100 years of striving and work by many people. 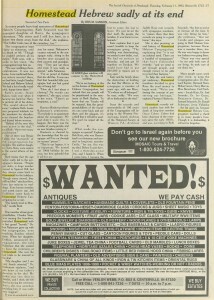 The articles in the Jewish Chronicle merely scratch the surface and pass over many, many people who poured their sweat, tears, and actual physical labor into what was and thanks to those still there survives as a wonderful piece of Jewish history.” For me, the articles are wonderful less for the specifics of history and more for understanding the mindset of the community about its history and its conclusion. Next year, Homestead Hebrew Congregation — officially Congregation Rodef Shalom — would have been 100 years old. But instead of preparing for celebration of the centennial of the synagogue, congregants instead have been busy dismantling the building, trying to preserve a century of history. The building was sold last month to the Community of the Crucified One. Declining membership and an aging population led the Congregation’s “caretakers” — members who lovingly kept the building going — to make the hard decision to close the book on an official Jewish presence in Homestead. The story of the influx of Jews to Homestead is a fascinating one, a story that was repeated in small towns throughout Western Pennsylvania over the last century. And the story of the decline of the community is common, too. As Jewish children left their parents’ roots, moving to suburban meccas, or in the case of Homestead, across the river to Squirrel Hill, once thriving Jewish enclaves suffered. Pockets of families may be left here and there, but the nucleus of the Jewish community has shifted. That was the case with Homestead, as with many other small towns along the rivers of Western PA. But the commitment and love of the members of the Homestead Hebrew Congregation to their heritage sets them apart. Homestead Hebrew Congregation will live on, thanks to an arrangement between Congregation Beth Shalom in Squirrel Hill, the Jewish Historical Archives of Western Pennsylvania and the Pittsburgh Index of Judaica and Jewish Art. When congregants realized that the sale of the building was imminent, they began to search for a home for their five Torahs. Explains Ruth Seiavitch, whose father was the “shammas” of the shul for 40 years, “Many people wanted our Torahs, but we decided to give them to Beth Shalom because they are also taking our memorial plaques and veterans plaques. We want our people to be remembered. Beth Shalom is preserving more than just that. It is also dismantling the bima and the ark, and restoring it for use in their synagogue. The Western Pennsylvania Jewish Historial Archives have taken an interest in Homestead, too. They’ve asked for all the records, prayer books and photographs to document Jewish life in Western PA over the past century. Florence Hiedovitz, another member whose family ties to Homestead Hebrew Congregation goes back generations, notes that Judith Ross of the Archives is preparing for the task. “Our records and minutes, the original deed, seal of the congregation, all of this has been turned over to Judith Ross. It reflects the history of our community. The fact is that all of a sudden little towns with a Jewish presence are expiring. “She also wants to do an oral history, but we’re trying to get funding for that,” adds Florence, an energetic and tireless worker on behalf of Homestead. “Kitty Ruttenberg, too, is documenting this for the Index of Judaica,” Florence continues. The congregation’s unique Judaica includes silver Torah crowns and breast plates brought back by the father of current member Dr. Dan Schwartz from Hungary, and an embroidered tablecloth that tells the history of Homestead’s Jews. Even the basics of the synagogue are finding new homes. The benches and small bima are going to a newly formed Orthodox shul, explains member Bob Katz. “The kitchen went to a Solomon Schechter School in Ohio. I feel very sad about the building being sold, but feel good to know that something good has come out of all this,” he adds. The Homestead Jewish community has a rich and loving tradition, fortunately well preserved in written synagogue histories. Wrote Isidore Grossman 1, the congregation’s secretary for decades,” Before 1890, Homestead was a void as far as Jewish population was concerned. We had in Homestead two or three Jewish families. The families “rested” until March, 1894, when a Sam Markovitz, had yahrzeit but couldn’t find a minyan. That led Markovitz, Isidore S. Grossman and others to decide that an organized Jewish presence was needed. On March 18, 1894, the Homestead Rodef Sholom was born. The synagogue began with 18 charter members, many of whose children, grandchildren and great-grandchildren remained loyal to the congregation. 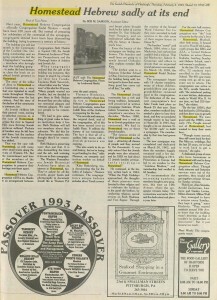 The dedication of the nascent congregation’s first Sefer Torah took place on March 25 of that year. Soon after, members realized they needed a place to bury their dead, and they accumulated enough money to buy land in Homeville. In 1901, they bought a lot on Ammon St. “for $1500 cash” to build a synagogue. The membership by that time had grown to 40. The new synagogue was completed and dedicated on March 30, 1902, and there the members happily remained until a fire destroyed the building in 1911. Persecution in Europe had led to an exodus to the “Goldene Medina,” and membership had swelled to 65 families. To accommodate the increasing numbers, members bought a new property, this time on 10th Avenue, where the synagogue remains today. The cornerstone was laid in 1913 and the dedication took place a year later. For the next half century, Homestead Hebrew Congregation was “the” hub of activity for the area’s Jews — Homestead, Munhall, and other little towns. It house an active B’nai B’rith Lodge, youth groups like BBG and AZA, a United Hebrew Charities, an active Chevra Kadisha, bustling Sunday and Hebrew School, men’s and women’s auxiliaries. In the late 30’s and early 40’s 72 students were enrolled in the Sunday School. The 40’s saw many young men go off to war, some not to return. The congregation was active in the 50’s, recalls Seiavitch, with “the sisterhood putting in a new kitchen, dedications made to World War II. A one time, we had 325 families,” she related. “By the late 1950’s, that had declined to 250 families, and then there was no growth in Homestead. We were good until the 1960’s, even early 70’s. People moved out of Homestead, but wanted to keep their roots here. “Though some moved, they still came back for their Bar Mitzvas, weddings. But the last 20 years, we’ve had to work hard to get a minyan,” she sighs. A dedicated group of men who have businesss in Homestead still tried to keep Homestead Hebrew Congregation afloat. Though daily minyans and Saturday services were out of the question, they would still get together at least 10 men for Sunday services. Next Week: The congregants react. The congregation kept Harry as shammas, until his death at 96. “Though he couldn’t perform all his duties,” Ruth says, with a smile in her voice, “the congregation kept him on. Ruth’s sister, Jessie Ruben, took over when it became too hard for Harry to perform all of his duties. “She would shovel the snow,” explains Ruth. Jessie also prepared kiddush for the members for decades, even cleaned the benches and dusted before services. One of them was Bessie Coltin, the ‘matriarch’ of the congregation for decades. She and her daughter, Yetta Stein, were central in the social affairs of the shul. Ruth thinks that the age factor really led to the synagogue’s demise. “People got older, a large number moved to Squirrel Hill, but they always came back to Homestead for the holidays. Though some moved, they still had their” simchas there, from bar mitzvahs to weddings. Even former member and noted movie star Jeff Goldblum came back Homestead Hebrew Congregation for a visit. “His family lived in Munhall,” recalls Ruth. One member whose great-grandfather, Charles Stein, was among the founders, provided Homestead with a last grand “hurrah.” Dr. Iris Nahemow grew up with the congregation, even teaching Sunday school there. When her daughter, Debbie, announced her engagement, she told Nahemow that she wanted to have the ceremony at Homestead. She was the last bride to be married in the shul. It was an emotional occasion for many. Nahemow’s cousin returned to the synagogue early, sitting in the benches once occupied by their parents and grandparents. “They just sat there and cried. It was really so special,” adds Nahemow. “I’m so proud of Debbie that she did this. It was nice that the beautiful little synagogue had one last grand day of being full. “This is our legacy, it is so important. We missed our 100th birthday by one year, but how splendid that it will live on. Soon the records and memorabilia of 100 years of the Congregation will be going to the Western Pennsylvania Jewish Archives of the Historical Society of Western PA. Archivist Judith Ross met recently with synagogue members, to “assure them that their records are going to a good home” she says. To help the oral history get underway, Homestead members decided to give Ross the seed money to begin work. “We’re continuing the concept of preserving our heritage,” explains Florence Hiedovitz. Homestead recently suffered another loss with the death of long-time member Oscar Cohen. Cohen had been chairman of the cemetery since the early 1950’s, and was, according to Ruth Seiavitch, “the first to arrive at minyan all the time. It was very fitting for him” she continues, “that our Torahs and plaques are going to Beth Shalom Congregation, because Oscar was a member there, too. He was very happy to know our Judaica was going there. Many people came, week after week, to keep the Congregation alive. 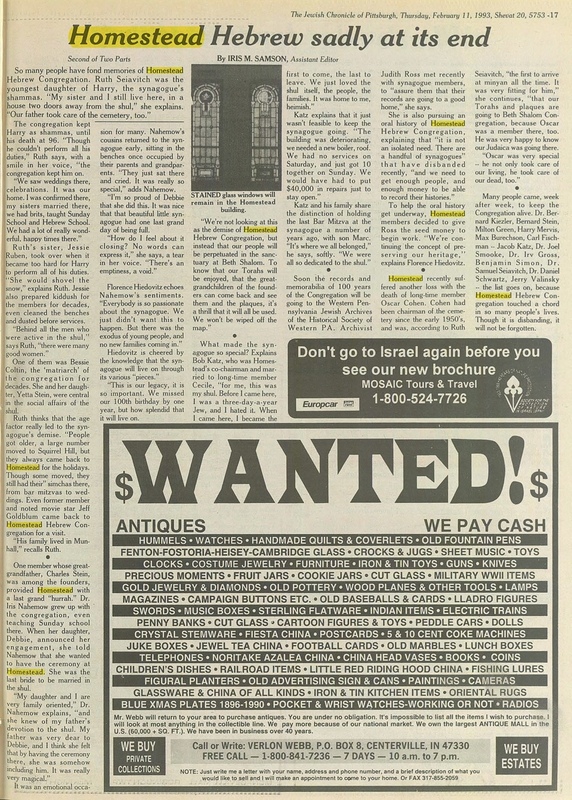 Dr. Bernard Keisler, Bernard Stein, Milton Green, Harry Mervis, Max Burechson, Carl Fischman — Jacob Katz, Dr. Joel Smooke, Dr. Irv Gross, Bejamin Simon, Dr. Samuel Seiavitch, Dr. Daniel Schwartz, Jerry Valinsky — the list goes on, because Homestead Hebrew Congregation touched a chord in so many people’s lives. Thought it is disband, it will not be forgotten.